The captain’s platter doesn’t have deviled crab! 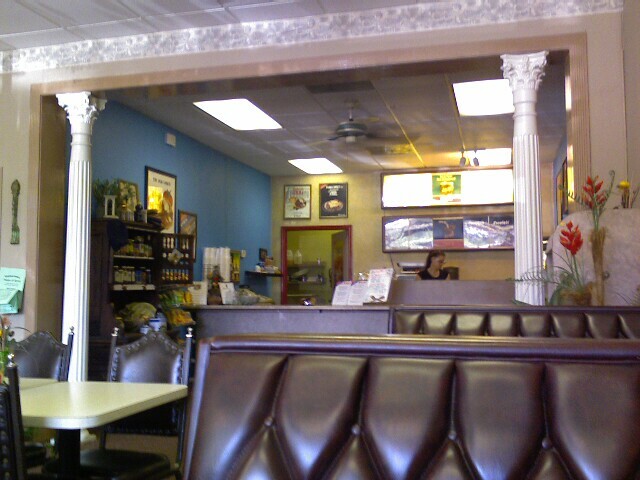 I had a great quick lunch at Captain Pete’s house of Gyros. 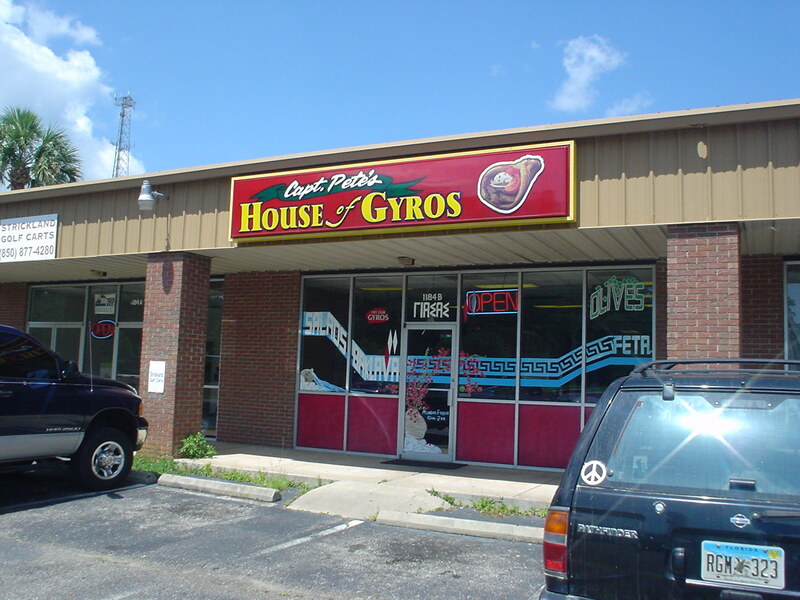 There are quite a few places in town to get Gyros but Captain Pete’s is one of my favorites. Fresh, fast and they always have something a little special if you are in the mood. Its located on Capital Circle near Park Ave.
My buddy Steve got the King Gyro- just like you expect with great meat and sauce. I ventured out a little and got the Camel Rider; Seasoned Ground Beef mixed with lettuce, diced tomatoes, onions & Tzatkizi sauce wrapped in a pita. 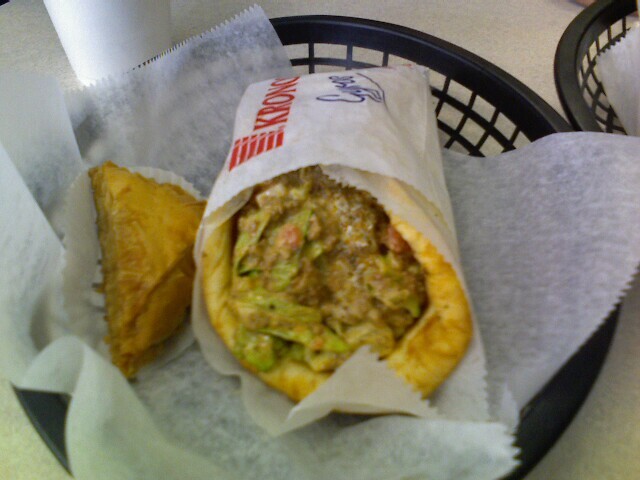 Its the one in the photo (you know what a regular Gyro looks like, right?) Think Greek Sloppy Joe. Tasty and messy!! Dessert was a slice of Baklava with lots of honey and nuts, Very nice! There are several other desserts to chose from but its hard for me to get past baklava. Iced mint tea is always available along with regular sodas. I have not tried any of the special dinners but they look worthy. Check out the difference between 11:50 and 12 noon! Limes just make EVERYTHING better… especially Cuban food. For some reason Barry and I get a hankerin for Cuban food on Sunday afternoons. Not sure why, we just do. 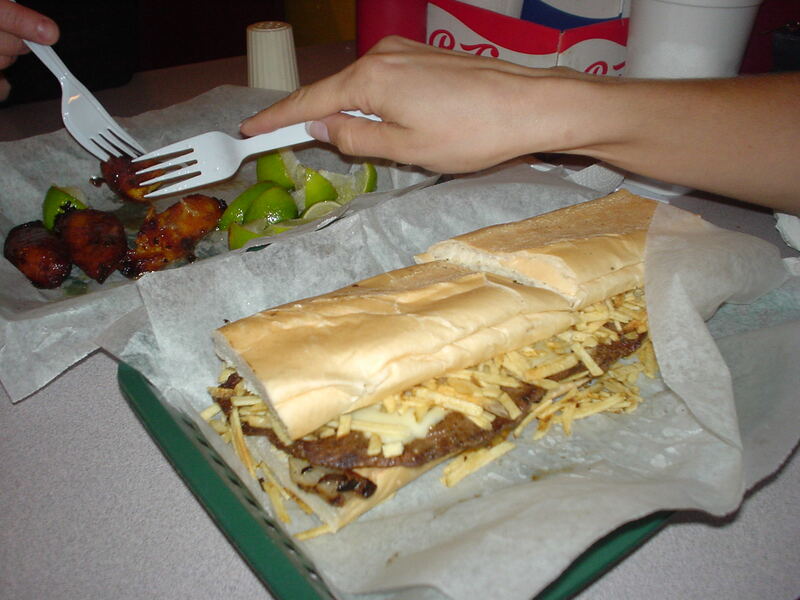 Typically our Cuban restaurant of choice is Gordo’s, a fantastic dive near FSU’s campus, This time though, we decided to go to the Black Bean on Appalachee- very good choice. First of all you must order their Mango Sweet Tea as quickly as you can, squeeze tons of fresh lime juice and you will be immediately refreshed. This wakes up your taste buds, helping you decide what should be enjoyed next. For us, the next taste experience that’s absolutely necessary to the Cuban experience is to order an appetizer of the Maduros. These are sweet morsels of caramelized, ripe plantain perfection. As stated in my subject line, the addition of fresh lime juice squeezed all over these slightly crispy on the outside, silky smooth n sweet on the inside morsels of culinary pleasure, with just a pinch of salt puts Maduros right over the edge for me. Probably not the most traditional way of eating them but I don’t care and you won’t either after trying them that way. Next, my pressed Steak Sandwich with grilled onions, swiss American cheese, topped with those crazy awesome potato sticks. The sandwich is wonderful just as it is but as you will learn, I love the perfect condiments. This calls for lime juice and their tangy hot sauce. The combination is just brilliant. Our lunch companion Natalie ordered her favorite Guava Habanero BBQ Pork Sandwich… need I say more? It’s enough to feed a normal person at least twice and I imagine the leftovers are even better the next day. Barry ordered the best dish of all though. Frankly, I’m salivating and speechless. The dish is called Masitas. This is slow cooked pork cut into kabob size chunks, DEEP FRIED and topped with grilled onions and mojo. Seriously, it’s indescribably good. Crispy on the outside, tender and juicy on the inside. It was recommended by a some of Barry’s clients, a Cuban couple. 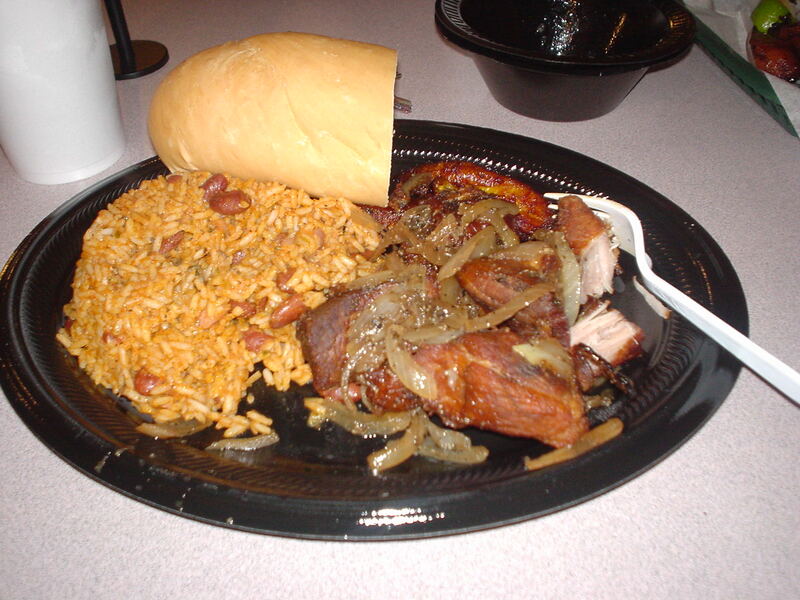 This was served with their Congri- Red beans and rice cooked together with Spanish sausage (as if one needed more pork… wait, did I just say that??? NEVER too much pork). Barry likes the Congri at Gordo’s Better. The portions are generous. 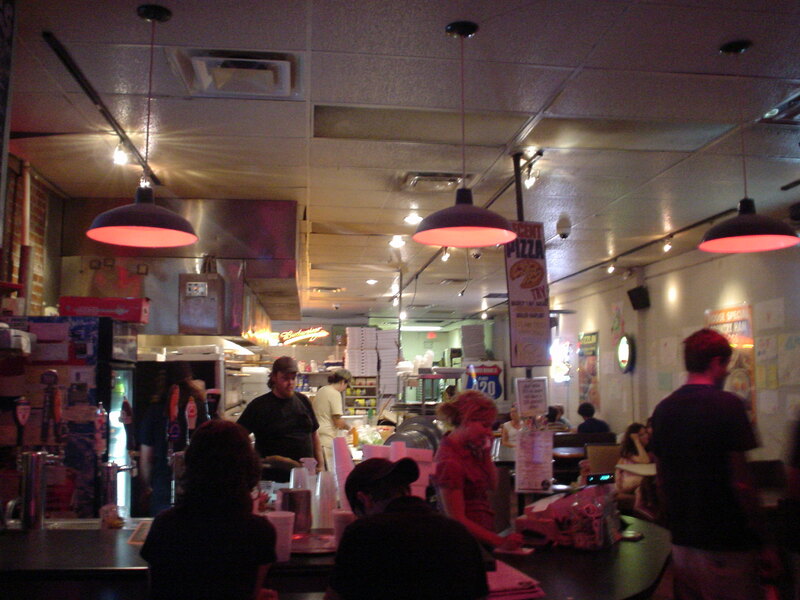 The atmosphere is informal and unpretentious. It’s very family friendly, kids eat grilled cheese or black beans and rice FREE. Do remember the limes. The Black Bean is never in short supply of limes and you absolutely cannot go wrong adding more lime juice to most any dish you order. If you’ve eaten there, please let us know what else we need to order. Happy eating! When we moved back home to Tallahassee we were worried. Spoiled by all the great pizzerias in Atlanta, Pizza Hut and Papa Johns just didn’t cut it anymore. Where would we get a good slice of big city pizza in Tallahassee. Well early on we discovered Decent Pizza on Monroe street near Midtown. Its actually great! 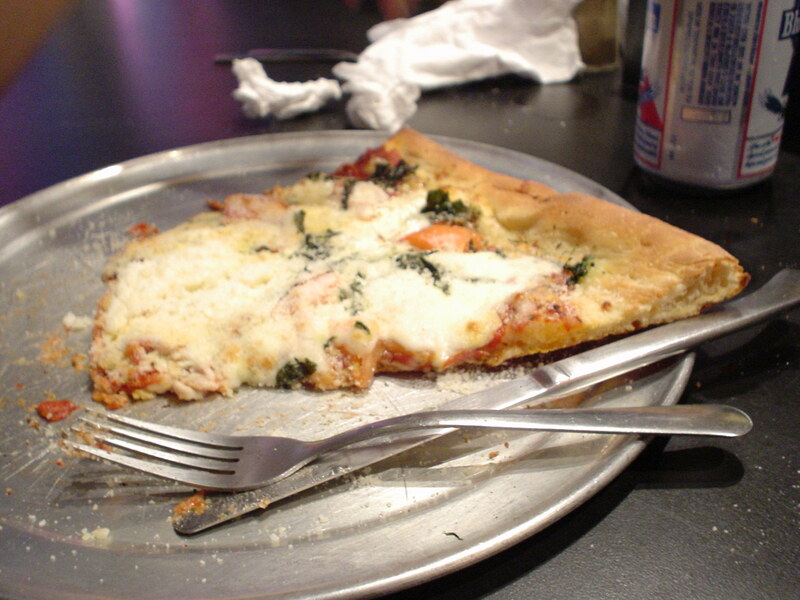 You can order pizza by the slice all day & PBR, our favorite pizza beer, is only $1.50 in the can. They have Sweetwater on draft and a decent selection of other beers. The pizza is exactly what you expect. Big slices, chewy dough and more toppings than you could ask for including Bradley’s country sausage. I tend to go for combos with meat, Jessi enjoys the pizza margarita and Hawaiian. 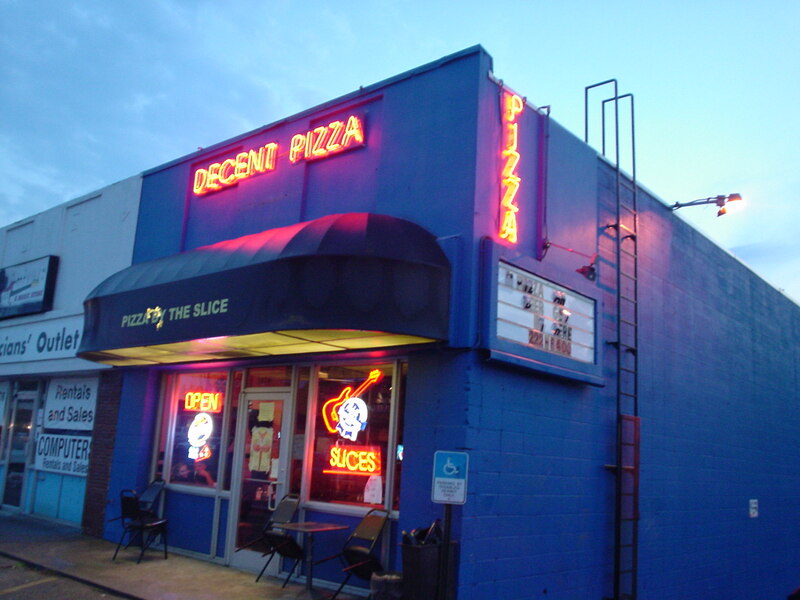 One of the best things about Decent is the atmosphere. 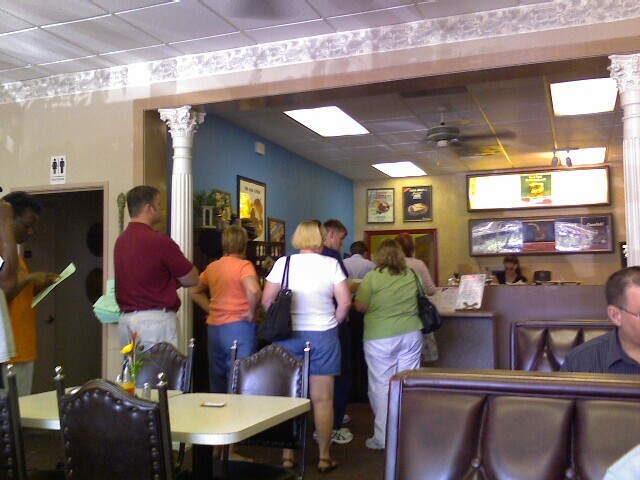 Its filled with a great buzz of customer chatter, kitchen noises and super music. The eclectic mix of music is matched by the patrons. You see a cross section of Tallahassee, every age & every kind of person. There are other good pizza places in town- The same guy who started Decent started Momo’s a few years before. 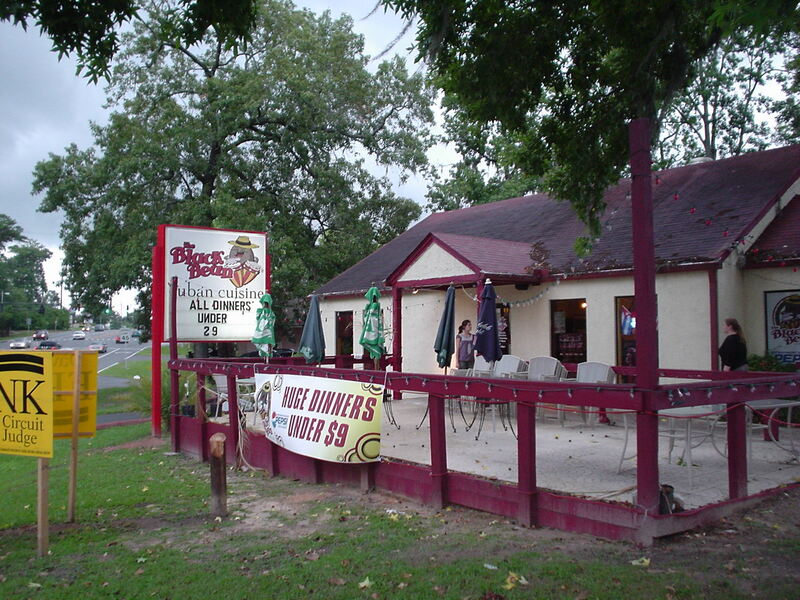 He had a non compete and started another restaurant in Athens, Ga. Then returned to Tallahassee and opened Decent. Momos is good- just not our favorite. Another favorite since high school is Barnaby’s. You have to wait for a review of that one!